Toronto may not rank with New York and London on the world scale, but as a Canadian it has always held the same attraction as a setting for fiction. Michael Ondaatje’s In the Skin of a Lion (sorry — last read by KfC pre-blog, so no review here) and Hugh Garner’s Cabbagetown (review coming later this year) are Canadian classics set in historical working-class Toronto neighborhoods. Shaughnessy Bishop-Stall’s Ghosted offers a compelling portrait of the city’s contemporary underbelly; Michael Helm’s Cities of Refuge explores some of the darker aspects of Toronto’s reputation as a welcoming destination for immigrants and refugees. I was born and raised in Kitchener, just an hour down the road from Toronto, and have been visiting the city throughout my life. Mrs. KfC and I lived there for a couple of years (2003-2005) on Ardwold Gate in tony Forest Hill. Until a Depression era fire destroyed it, Ardwold was the estate of the Eaton family (scions of Canada’s now-shuttered department store empire). There is an arc of upper-class neighborhoods that stretches across the “top” of downtown Toronto, with Rosedale and Moore Park on its east, Forest Hill on the west. Mount Pleasant Cemetery sits like a keystone in that arc — the 200 acres set aside in 1876 are now the final resting place of more than 170,000 ranging from Prime Ministers (William Lyon Mackenzie King) to pianists (Glenn Gould) to plutocrats and philanthropists (that same Eaton family, the Masseys and the Westons all have crypts there). The cemetery is well-known to anyone in Toronto since a major north-south thoroughfare of the same name passes through it. 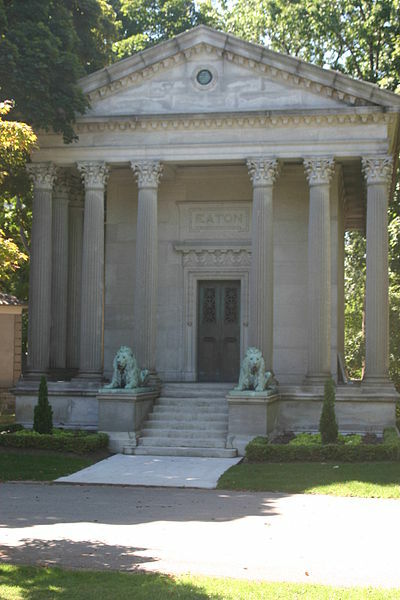 Mount Pleasant Cemetery serves the same function as keystone in this novel that it physically does in that upper-class arc that stretches across Toronto. Harry Salter was born and raised in Rosedale — his elderly mother still lives in the mansion where he spent his childhood. Harry and his wife live just south of the arc in one of the working class neighborhoods featured in Ondaatje and Garner’s novels — neighborhoods that have now become gentrified, so they paid more than $500,000 for the fixer-upper they call home. And Harry’s father, Dale, who made his fortune as a Bay Street investment advisor, will die of cancer early on in the novel and be buried in Mount Pleasant, cementing that keystone in the story of Harry’s life. As the novel opens, Harry is facing that inevitable death, but it at least has an upside: Harry has been spending well beyond his means and risks having to depart the upper-class privileged neighborhoods where he has spent his life. The $1 million he expects to get from the estate should cover his debts — but it becomes a case of hopes raised, hopes dashed. Contrary to the popular dictum, Harry’s father had taken his money with him. It was, at any rate, gone. The reading of the will had the giddy outrage of a practical joke. The executor, a terse stranger from one of the large, threatening law firms, revealed Dale to be essentially broke, a shock to both Harry and his sister, and a much bigger shock to Dixie [his divorced father’s final lady friend who was expecting even more than $1 million]. The three of them sat in the lawyer’s office as he intoned the will’s clauses with appropriate solemnity, accompanied by a paper version handed out with numbers and percentages highlighted. More than half the estate went to Dixie, a fact that was quickly mitigated by the alarmingly small sums involved. Dixie received $7,200. Harry was second, with $4,200. Erin, an enraged and distant third, received $1,100. Harry and his wife are already in marital crisis — not just from their shaky economic status, but also facing the difficulties of estrangement from their university student son. So Harry, who spent most of his career as a broadcast journalist before ageism punted him into academia, decides to apply his investigative talents and figure out just where his father’s money went. He has the monetarily-jilted Dixie as a semi-partner in this quest, since she too is convinced something must be amiss. So there you have an outline of setting, characters and plot. How well does author Gillmor deliver? On the setting front, he does just fine — but I have to admit that judgment may mainly be a reflection of the anticipation that I took into the book. The way that he describes Rosedale and Harry’s mother’s mansion, his troubled gentrified existence and the keystone aspect of the cemetery were for this reader by far the strongest aspect of the book. Then again, I know the area reasonably well and cannot say how much of a role my own experiences played in my appreciation of his portrayal — there were a lot of very “friendly” reminders that brought back personal memories (if you know Toronto at all, the Five Thieves show up tangentially in the opening paragraph of the book — Harry pays $82 for “organic” lamb). The novel starts to slip when it comes to character. Harry is adequately developed (particularly when he is spending money he doesn’t have on luxuries, like organic lamb not to mention wine, he thinks he can’t do without), but not much more — alas, the rest of the cast tend to be one-dimensional at best. And the plot (the search for the “missing” millions) just doesn’t work at all. I can understand why Gillmor needed one (we can’t have a novel based just on setting and lifestyle) but the weakness of that aspect of the book becomes a significant anchor to the whole enterprise as it tries to move on. I wasn’t disappointed with Mount Pleasant, but I’d have a tough time recommending it — unless you share my going-in bias for a novel that is located in an area of Toronto that I feel I know quite well and was eager to experience in prose. All in all, a promising premise that simply wasn’t successfully realized. The closest possible source was a lonely chapel about four kilometers southwest on the old Hochmeiss estate but not only did that not have no bell but the tower had collapsed during the war and at that distance it was too far to hear anything. And in any case they did not sound distant to him, these ringing-booming bells; their triumphal clangor was swept along by the wind and seemed to come from somewhere close by (“It’s as if they were coming from the mill…”). He propped himself on his elbows on the pillow so as to look out of the mousehole-sized kitchen window that was partly misted up, and directed his gaze to the faint blue dawn sky but the field was still and silent, bathed only in the now ever fainter bell sound, and the only light to be seen was the one glimmering in the doctor’s window whose house was set well apart from the others on the far side, and that was only because its occupant had for years been unable to sleep in the dark. The “estate” on which this takes place once had an economy — it no longer has one. Everyone who is still there longs to be somewhere else, with some chance of recovery. Sounds, like the bells, will often be an important factor but, again like the bells, their source will be more one of question than answer. They represent a summons or warning, but to what no-one really knows — more than anything else they represent an absence of the known. The story will unfold through the distorted eyes of individual characters as viewed from their confined circumstances, both physical and mental. No one in this book knows more than a small part of the story; all are searching for more. While the present is definitely not right and the future is oppressively ominous, there is always an equally powerful wish that elements that are not understood (where are the bell sounds coming from?) represent a reason for hope, not despair. While Krasznahorkai may decline the use of paragraphs, he does not hesitate to frequently shift points of view — for this reader, the sudden changes in focus were one of the book’s greatest strengths. In that opening chapter, Futaki heads off to the Schmidts to collect his share of some money from a transaction we are given to understand has shady elements. Mrs. Schmidt (her claim to fame is inspiring, and often indulging in, the lust of most of the men of the estate) greets him with a story about a horrible dream where she saw a threatening presence peeking through the curtains at her window. Irimiás and Petrinas, gone for a couple of years and allegedly dead, are indeed on their way back. They may be harbingers of hope — then again they may represent the forces that will lead the entire small community into even greater despair. I mentioned earlier that structure is a never absent element of Satantango. The first six chapters count from I to VI and are filled with the foreboding arrival of the pair (not to mention the squalor of the present on the decrepit “estate”). They conclude with a multi-page dance sequence (the “satantango” of the title, I presume) involving virtually all the characters in the bar and the arrival of Irimiás and Petrina. “The Second Part” (that’s the translator’s device) opens with a speech from Irimiás about what the future holds — the chapters here count down from VI to I. The members of the community bet their future on the vision that he offers — you’ll have to read the novel to see whether or not that is well placed. There is no doubt that Satantango has its fans. It first come to my attention with an enthusiastic review from Max at Pechorin’s Journal — he went on to name it his best novel of 2012 and his review provides a much more detailed analysis than I have offered here. And Satantango is a fixture on the various translated book prize longlists that are currently in play. As much as I respect that, I have to say it was not a novel for me. I was never tempted to put it aside but the entire reading process was a frustrating struggle — I could appreciate the elements of technique that were on display but found little underneath that to reward the effort of paying attention. I don’t think that I am completely averse to either modernist or existential fiction, but Satantango never succeeded in engaging me in the author’s journey. Including Mordecai Richler in KfC’s 2013 project of re-reading Canadian authors who influenced me was a no-brainer decision from the start. Like any Canadian reader of my era, I have known his fiction well for decades (and interviewed the man himself more than once). It was equally impossible to not be aware of his controversial political reputation — Quebec sovereignists have a one-man category of detest reserved for him. And there is no doubt that he is a special “friend” of the blog: The Apprenticeship of Duddy Kravitz is easily the most popular archived post here and Barney’s Version holds down sixth spot. Having already reviewed those two popular choices did mean that deciding which Richler novel to include provided some challenge. In the final analysis, it came down to St. Urbain’s Horseman or Solomon Gursky Was Here — the first of those two is probably both better known and more typical of his work, the latter is perhaps his most unconventional adult novel. It has been some time since I last read Gursky and memory said that it had been a bit of a challenge — that was spark enough to convince me it was time for a revisit. There are a number of traits that are present in all of Richler’s fiction. Growing up Jewish in Montreal is one, for starters. The plot line is always a rich stream, with the author usually enjoying pushing the envelope towards the bizarre. And in every book he uses those two over-arching themes as fertile ground in which to seed acerbic satire and grumpy, but often hilarious, observations on aspects of the current state of play. All those threads are present in Solomon Gursky Was Here, but they come in different proportions than in his more popular works. The Gurskys are certainly Jews now living in Montreal, but that element doesn’t come with the usual familiarity of Richler’s St. Urbain Street — in this novel, they have roots elsewhere and have graduated to prominent global capitalism in the present. What is most distinctive in this novel, however, is that Richler pushes his many plots even further into the absurd than he usually does — and that does produce some challenge for the reader. The dogs were pulling a long, heavily laden sled at the stern of which stood Ephraim Gursky, a small fierce hooded man cracking a whip. Ephraim pulled close to the shore and began to trudge up and down, searching the skies, an inhuman call, some sort of sad clacking noise, at once abandoned yet charged with hope, coming from the back of his throat. In spite of the tree-cracking cold a number of curious gathered on the shore. They had come not so much to greet Ephraim as to establish whether or not he was an apparition. Ephraim was wearing what appeared to be sealskins and, on closer inspection, a clerical collar as well. Four fringes hung from the borders of his outermost skin, each fringe made up of twelve silken strands. Frost clung to his eyelids and nostrils. One cheek had been bitten black by the wind. When the first evening star appeared they saw the little dark men, beating on skin drums, parading their women before them to the entry tunnel of Ephraim’s igloo. Ephraim appeared, wearing a black silk top hat and fringed shawl with vertical black stripes. Then the little men stepped forward one by one, thrusting their women before them, extolling their merits in an animated manner. Oblivious of the cold, a young woman raised her sealskin parka and jiggled her bare breasts. Finally Ephraim pointed at one, nodded at another, and they quickly scrambled into his igloo. The men, beating on their drums, led the remaining women back to their igloos, punching and kicking them. An hour later they were back, all of them, and one after another they crawled into Ephraim’s igloo. Okay, some back story is required here. The conceit is that Ephraim Gursky was a member of Sir John Franklin’s ill-fated 1845 expedition to the Canadian Arctic — while conventional wisdom says no one survived, Richler fiction says not only that Ephraim did but he has moved back and forth between the Arctic and southern Canada ever since. And is the ancestral father of the Gursky empire, a family-run business which is now a major player in the global liquor trade. That empire was created by Ephraim’s grandsons, Bernard, Morrie and Solomon, during the Prohibition era. Building off a stake Solomon won by stealing and risking the family “fortune” (meagre savings from his father’s rural Saskatchewan hardware business) in a Prairie poker game (one of his prizes was the deed to the local hotel), they eventually got into the liquor-running business in Western Canada, moved east to the more lucrative Windsor/Detroit run and when Prohibition ended were well-positioned in Montreal to move into the “legitimate” liquor business where they have done exceedingly well ever since. Solomon actually disappears from the novel shortly after that poker game — a sled (apparently driven by Ephraim) arrives and takes him north towards the Arctic. A central uncertainty of the plot is whether or not he is still alive and just what influence he has on its various elements. That uncertainty provides yet another story line in the novel. Moses Berger is the son of the failed Montreal literary poet, L.B. Berger. As a child, Moses lived down the Mount Royal slopes from the Gursky family multi-mansion estate and becomes obsessed with Solomon’s story from the first time he hears of him. Moses’ lifelong pursuit of that story introduces a whole new set of oddball characters with whom Richler can play. All of that is a very rudimentary sketch of the various story lines in Solomon Gursky Was Here. Each features a pretty much independent set of characters (although there is some overlap), each has its own intricate plot developments and each provides the author a platform for digressions into cryptic observation or bitter satire. Richler loves complexity and detail and you can rest assured that he spares none of it in any of the story threads. The problem that I had the first time I read this novel was that there is so much going on (and so many people doing it) that I had a lot of trouble keeping it all straight. Richler shifts focus frequently and without warning — particularly in the first half of the book, when he is establishing these widely varied stories, I felt buried in a wealth of detail and characters whom I only vaguely remembered. The parts were certainly interesting and entertaining, but I wasn’t getting much of a sense of the whole. That frustration did settle down midway through the book (although, given that it is 557 pages, that involved a considerable investment of time) and I found the latter half much more engaging. I must say I did have a similar experience this time through (my third, perhaps fourth, read of the novel) but had the comfort of knowing that it all does eventually come together. 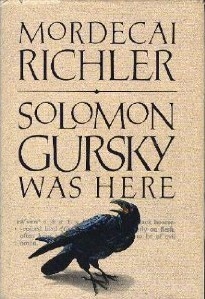 The jacket promo of my first edition of Solomon Gursky Was Here refers to it as Richler’s “most ambitious and mysterious novel”. I would certainly quibble with “most ambitious” (Duddy and Barney both have an admirable depth to them) — “mysterious” is fair if you accept that it has both negative and positive possibilities. Richler is generally a very accessible author but that is not always the case with this one. His canvas for this one is truly large — while all the parts show his considerable ability, for this reader the bigger picture does not come together quite as readily as it does in his more popular novels. The Dinner is the first of Herman Koch’s seven novels that I have read (actually, as far as I can tell it is the only one that has been translated into English) but the Dutch author has already claimed a spot in a sparsely-populated room in KfC’s gallery of reading. I have an abiding affection for books that successfully establish an engaging “realistic” story and then, dramatically or with careful deliberation, successfully change course and head somewhere far darker. Patricia Highsmith’s Ripley novels are a perfect example — although, after you have read the first one, you know a bizarre twist is inevitable in the others. Gerard Woodward’s Nourishment is one that features a number of sudden left-turns in plot, all accomplished without losing momentum. And while I haven’t read Gillian Flynn’s best-selling Gone Girl I gather it hinges on a plot disruption so important that every review I have read goes out of its way to avoid a reveal — so it is fitting that Flynn blurbs The Dinner on my copy. As the title promises, Koch’s book is about a “dinner” and the volume is structured with labelled courses, opening with Apertif and concluding with Digestif, and like any multi-course dinner the interesting tastes of the first few courses acquire increasing boldness and complexity as the experience proceeds. A few centuries from now, when historians want to know what kind of crazies people were at the start of the twenty-first century, all they have to do is look at the computer files of the so-called “top” restaurants. That information is kept on file — I happen to know that. If Mr. L was prepared to wait three months for a window seat last time, then this time he’ll wait for five months for a table beside the men’s room — that’s what restaurants call “customer relations management”. Except for one important detail, that pretty much sets up the first few “courses” in the book. Paul’s brother is one of those pretentiously successful people who love to exercise their influence — and there are restaurants that are every bit as pretentious that cater to them. Serge had wanted to show his “people” side by meeting Paul and Claire for a drink at a nearby, very unpretentious, cafe where they are regulars before the meal. Paul rejected the invitation because the cafe is Paul and Claire’s kind of place and they don’t want to introduce his phoniness to it: that “important detail” yet to be revealed is that Serge is the leader of the Opposition party in Holland and is expected to be the country’s next Prime Minister. Visiting the populist cafe would merely be an exercise in vote-building imagery for him. Koch has more great fun with the restaurant, which deserves attention. Paul and Claire accept the offer of “the apertif of the house…pink champagne” served with “Greek olives from the Peloponnese, lightly doused in first-pressing, extra-virgin olive oil from Sardinia, and polished off with rosemary from…” — only later realizing that the house apertif comes at ten euros a glass. By way of contrast, the cafe serves a full meal of spareribs and fries for 11.50 euros. Yes, it had to be the owner, for now he stepped forward to extend a personal welcome to Serge and Babette. “They know me there,” Serge had told me a few days ago. He knew the man in the white turtleneck, a man who didn’t emerge from the open kitchen to shake hands with just anyone. The guests, however, pretended not to notice; in a restaurant where you had to pay ten euros for the apertif of the house, the rules of etiquette probably didn’t allow for an open display of recognition. They all seemed to lean a few fractions of an inch closer to their plates, all apparently doing their best at the same time to forge ahead with their conversations, to avoid falling silent, because the volume of the general hubbub increased audibly as well. And while the manager (the white turtleneck had disappeared back into the kitchen) was escorting Serge and Babette past the tables, no more than a barely perceptable ripple ran across the restaurant: a breeze falling across the still-smooth surface of a pond, a breath of wind through a field of grain, no more than that. They were red around the edges, and bigger than normal: unmistakable signs of a recent crying jag. Not a crying jag that had happened a few hours ago — no, crying that had happened just now, in the car, on the way to the restaurant. The author takes all those no further at this stage — indeed, it will be a number of chapters before we discover what produced them. We also learn that this dinner is not just a social occasion but has an agenda: there is something the two couples “need” to discuss. And that both couples have teenage sons, Michel and Rick. Serge and Babette actually have two: Beau is from Burkina Faso and was supported financially by them there, but is now staying with them in Holland on what Paul calls a “rent-to-own” basis (he may or may not be staying on — the “adoption’ was a gesture from Serge to show his liberality). All of this is revealed almost in asides to the amusing phoney restaurant action (“The lamb’s-neck sweetbread has been marinated in Sardinian olive oil and is served with arugula,” said the manager…pointing with his pinky at two minuscule pieces of meat. “The sun-dried tomatoes come from Bulgaria.”), accompanied by Paul’s hilarious ongoing commentary on how awful all this is — his prominent brother included. Slowly but very, very surely, the disturbing plot elements move the restaurant phoniness to the side and introduce a harsh, disturbing reality to the dinner. The sons (Michel and Rick for sure, maybe Beau as well) have done something terrible, perhaps even criminal; it has been captured on a smartphone camera and is now on the internet, with promises of even more to come. Both sets of parents are aware of part (but not all) of what is behind this — both are also aware that it might also simply slip away out of sight if nothing is done. Once Koch gets all this established (say two-thirds of the way through the novel), we have a four-way dynamic between the parents and a three-way one between the teenagers on just what might or might not be done. Suffice to say, the decent, honorable, option is only one of the many that are available. It is important to note that Koch does not desert the restaurant story line — he piles these other ones on top of it (not unlike those fancy restaurant entrees that arrive in a carefully-stacked pile of five different “things”, with the hardest to cut on top, if I might be permitted a whining foodie metaphor). The humor of the phoney dining experience is now contrasted directly with the sordidness of what the adults seem willing to do. The result for this reader was a very well-balanced read, that touched a number of different taste buds. Released only recently in North America (to much media attention), it has now been published in 25 countries — one of those rare best-sellers that strikes my fancy. I’ve been waiting for the Canadian release following two enthusiastic reviews last year from bloggers whom I respect — Tom Cunliffe at A Common Reader and Guy Savage at His Futile Preoccupations — and it was worth the wait. I’ll even be happy to be assigned a table by the men’s room when Koch’s next English translation appears. For this reader, A Family Daughter is an unsual book, in an unusual way: my reaction to it is almost completely neutral. There are certainly books that enthuse me — Meloy’s own story collecton Both Ways Is The Only Way I Want It is a good example. An even greater number rank somewhere on the positive side of neutral or slip into the realm of disappointing. And then there are a few (fortunately, just a few) that I find just plain bad. This novel, most unusually, lands squarely in the middle. On the positive side, A Family Daughter was an engaging, two-session read. Novels that disappoint me tend to bring out my time-wasting “avoidance” behavior: rather than picking them up, I find reasons to scan websites or email instead of reading. This one certainly did not do that. But the further into it I got, the farther I seemed to move from the book. Characters and plot were okay (and definitely not annoying, as is sometime the case) but never much more. And as I approached the end, I found myself mainly thinking about which book I would read next, never the sign of a postive response to a book. A Family Daughter, published in 2006, revisits both characters and story that Meloy previously explored in her first novel, Liars and Saints, three years earlier. That book told the story of the Santerre family in post-War (both WWII and Korea) California — Teddy Santerre was a fighter pilot in both wars; his Canadian born and raised wife, Yvette, served as the central character in the story. They had three children: the eldest daughter, Margot, was even more Catholic than her mother, the middle child, Clarissa, was a rules-breaking rebel almost from day one and the only son, Jamie, was a late, unplanned arrival who mainly seemed to upset the comfortable equilibrium that the Santerres had established before his birth. That novel succeeded on a number of fronts (aspects of the sense of emptiness that followed the two wars, personal religious conflict, among others) and I thoroughly enjoyed it. So I was quite prepared to see why Meloy felt the Santerres were worth revisiting. Two hours later they came back, Abby sandy from the beach, with a tub of Dairy Queen ice cream and some Dilly bars that they rushed to the freezer. Abby chatted happily all through dinner, and it seemed to Yvette as if her cheerfulness were a wheel that Jamie had got spinning. Now he just needed to give it a push every so often, to keep it going. “Thank you, Jamie,” Yvette said, when she got her son alone. She couldn’t remember when she had last thanked him for anything but Christmas presents, and now she couldn’t stop. Meloy spends only 20 pages effectively re-introducing the Santerre family (and reminding us of some of their internal conflicts) and Abby is soon a freshman at the University of California, San Diego, the school where her mother and now-estranged father, Henry, met in the registration line. Meloy has a dark side and it moves to the fore in Abby’s junior year: Henry asks her to come along on a ski trip, but she declines — on his way through the Donner Pass, he hits a patch of black ice and plunges to his death. He was going to say they shouldn’t do anything more, but she waited like he said, watching him. He picked her up in the towel, with an arm under her knees and one under her back. He groaned a little, which made her laugh. Then he carried her out of the hallway into the bedroom and laid her down on the sublet bed, no excuses about how she had led him into it. He untucked the end of the towel and pulled it aside, and there was half of her, the soft breast, the smooth hip. It was right there in the Bible, as literature or not. Do not uncover the nakedness of your sister’s daughter, for she is your niece. It is a depravity. He pushed the other side of the towel away. There is enough hidden under the surface normality of the Santerre family that that wasn’t really a complete stunner, but I’ll admit that is where my “dis-engagement” with both family and novel began. Unfortunately, it continued to grow apace. The author develops story lines not just around Abby and Jamie, but Clarissa, Margot and Yvette as well — and for this reader they increasingly stretched credibility to the point that they seemed more designed for author convenience than reader enlightenment. I said in my review of Liars and Saints that I felt Meloy was a better short story writer than novelist, as much as I liked that volume (her limited catalogue now includes two novels, two story collections and one youth book) and I think my response to A Family Daughter reflects that even more. The various incidents that come into play are all developed individually well enough — they just never came together to produce a cohesive book. As I said at the start, Meloy is a strong enough writer that the novel was not a disappointment — an incomplete collection of well-observed incidents would perhaps be the best description. She certainly deserves to be read (and I look forward to her next adult book) but for those who don’t know her work, I would point to any of her other three volumes (all reviewed on this site) as a better place to start. A Family Daughter is most suitable for completists like KfC — and even I have to admit that the best of authors don’t hit it out of the park every time. Seeing Edith after all these years snatched the prospect of my own orderly death out of my hands. If Edith Black was not done with life then I was not done with it. The question that refused to let me sleep was whether I might recompense her with the truth. To embark on the confession that he and I resisted for so long. That he resisted. Most of all, the confession he resisted. It was his truth, after all, that he denied to us. And in denying it to us, denied it to himself. I was humiliated and left with nothing. But the largest burden of our cruelty surely fell on Edith, abandoned and alone with her child. The form of Pat’s cruelty was always in his denial of things that made him uncomfortable. Even in that great expansive art of his, encompassing our entire continent, a truth was denied, was kept to one side of the picture, in the silence. And it was great. His art, I mean. There was none greater before him and there have been none greater since. Not in this country. My poor sad country. This vast pile of rubble, as someone has called it, that we think so very highly of (it is all we have to think highly of). That “vast pile of rubble” is Australia and, after reading only the most recent of his 10 novels, I would have to say Alex Miller is one of its hidden gems, at least internationally. He is a two-time winner of that country’s prestigious Miles Franklin Prize (for Journey to the Stone Country and The Ancestor Game, his fourth and seventh novels) but Autumn Laing (released in 2011) is the only work readily available in North America — a quick search at the Book Depository in the U.K. shows only two others (Lovesong and Conditions of Faith) available there. Let’s go back to the excerpt, because it is a precise summary of what the novel will be. First off, it is very much Autumn’s story: inspired by what she thinks is the sight of a woman whom she wronged more than half a century ago, Autumn begins writing down her memories of what took place then. We know from it that she is guilt-ridden over “stealing” Pat from Edith — it will take almost the full 452 pages of the book before Miller reveals all the details of that because Autumn herself is unwilling to fully unpack the memories. And the excerpt offers the tantilizing hint that Pat is not merely an artist, but, at least in Autumn’s opinion, the greatest that Australia has ever produced. Pat was never deep. He was intuitive, but he was not deep. It was I who was deep. I who was left on my own to struggle with the fearful knots and tangles of our vicious web, while he sailed on in clean air, free of self-doubt, painting his pictures as if they were his alone to paint. So instead of eating my three little yellow pills I shall write this. Then I shall eat them. And so Autumn returns to 1930s and Ocean Grove, the run-down estate just outside Melbourne where she and her new husband, Arthur, set up a household. Australia at that point (much like Canada of the same era, I must say) is very much a country emerging from its British roots and the couple both come from prominent stock — Autumn’s family for a time “accounted for the largest fortune in Melbourne” and Arthur’s is almost as wealthy, although since their money comes from the land, they have a lesser social standing (“Arthur doesn’t think enough of money” is Autumn’s father’s summary opinion when he first meets the lawyer who will become her husband). The couple turn Ocean Grove into an Australian version of the rural retreats favored by the Bloomsbury group, attracting a coterie of Bohemian literary and artistic types. That’s the magnet that eventually brings Pat and Edith into the story. Edith’s grandfather was an outstanding Australian artist, but of the traditional Scottish model: “He was not a visionary. He did not see it as his business to challenge the authority of his masters. His subjects were leisurely pastoral scenes, farm buildings, crops and roads leading somewhere or other, a girl sometimes with a straw hat and ribbon going somewhere or other, a workman in a field with a horse, the sound of birdsong and maybe a butterfly or two.” He trained at the Slade School in London; Edith has inherited some of his talent and is enrolled at the Gallery School in Melbourne, at its best a dim colonial shadow of the Slade, where she paints delicate landscapes herself. For her, work is a subtle, delicate, mysterious coming together of the right mood and the right moment. Work is the difficult making of art. Striving, that is the word that characterises what she does. She has had to settle in to this house before she could begin, to feel herself to be in place. But not him. He was off. He had made five of his pictures by midnight the first night on his pieces of cardboard. She went to bed. After he had finished painting he sat in the kitchen reading and smoking cigarettes and drinking beer, and writing poetry in his notebook. He does everything at once. Writing, painting, drinking and smoking. He does not know if he is a writer or a painter. He does what he pleases. She was asleep by the time he came to bed and wanted to make love. In 1938, three years after Autumn and Arthur move into Ocean Grove, the four come together. Pat has headed into Melbourne to seek a “bursary” from a wealthy industrialist who supplies funding so young Australian artists can go to England — the art critic who screens applicants summarily dismisses him. A friendly receptionist in the philanthropist’s office gives Pat the address of Arthur’s law office, knowing he has more contemporary tastes. A sorely disappointed Pat does visit Arthur, more out of frustration than anything else, Arthur invites him back to Ocean Grove for dinner, and the door begins to edge open on what will be Autumn’s life of guilt. Autumn Laing, on its most obvious level, is a character story and all of these four (particularly Autumn) are fully-developed. There is a continuing sub-theme, however, that for this Canadian reader is every bit as powerful. I have made reference before to the similarities in Australian and Canadian fiction — one of the first posts on this blog discussed it in some detail. The Australia of 1938 is much like the Canada of the same era — both countries, politically and artistically, were just beginning to escape the apron strings of Mother England. Autumn, Arthur, Edith and Pat are each in their own way contributors to making that “independent” Australia come to life. I could cite a number of Canadian examples but will content myself with pointing to the recently-reviewed Carol Shields’ novel, The Stone Diaries, as one that features a similar heroine (Daisy Flett and Autumn Laing are both born in 1905) who will face some similar challenges coming of age and living adult life in a British colony that is turning itself into a country. If emerging Australia is the macro story and Autumn’s life the micro one, Autumn Laing has a wealth of “mid-level” story lines as well (e.g. the continuing conflict between Melbourne and Sydney for cultural and economic supremacy) that add even more depth to the novel — Miller isn’t just good at close-up and overview, he is equally talented at many things in-between. Because the narrative is being written by an 86-year-old from memory (and some chapters move to the third person), the switches in perspective often come without warning — this is one of those novels that both demands and rewards close attention from the reader. Autumn Laing first came to my attention last June with an enthusiastic review from Kimbofo at Reading Matters. I only decided to buy a copy, however, when David, a frequent commenter here whose opinion I respect, revealed that he had read no less than five Alex Miller novels last year (two, not including this one, made his top 10 for the year) — that is about as committed an endorsement as I can imagine. And the good news for this reader is that both Kim and David say that while Autumn Laing is just fine, it is not Miller at his best — given how much I enjoyed this novel, I can’t wait to get into his previous work. Once I figure out how to buy them without punishing shipping costs, of course — surely it is time that some entrepreneur figures out how Canadians can read Australian writers (and vice versa) at something close to the posted cover price.